1936 Chevrolet. We towed this in 2010, handed down in one family since new! Their grandfather bought it in 1936. Our World has been changing very rapidly, computers have been a blessing and a nightmare for small businesses at the same time. Years ago all businesses where published in one all inclusive phone book, if you were in business your customers could find you and if you did good work or bad, the news would spread from word of mouth as people would discuss their experiences, fast forward to 2017 and there is no longer one phone book, there are several phone books and a multitude of web sites that tout themselves as comprehensive directories, in reality they are merely holding businesses hostage for money, either you pay them or you don’t exist and with so many sources to search, it is getting increasingly difficult to reach a fraction of, let alone all, customers seeking your services or products, businesses are being pitted against each other! We are existentially being forced into a war over being visible and whomever is willing to damage themselves the most financially, paying the highest dollar, gets visible, but at what cost? Who do you think pays for that in the end? The advertising costs come out of the profits of the business, less hard earned money for employees, equipment, and investors, Also you guessed it the bill for the product or service will be higher or the quality will be lower. Now there are online reviews some true and some fake, in reality very few people take the time out to leave a review on a business unless you prompt them or they just want too, this takes time. Here are some actual real customer reviews from our customers.. There are others on line posted in various sites, we will try to copy them and post them here as we come across them.. Welcome To PHIL’Z TOWING! We carefully transport your vehicle at a fair price. Free quotes call us now =) 210-845-3435 WE ARE A REAL BUSINESS, LICENSED AND INSURED IN SAN ANTONIO, TEXAS! Quicker response typically around hwy 151, Ingram, Potranco, hunt lane, Marbach, Dugas, Culebra rd. I highly recomend phil “z towing. My car broke down on my way to work. I got a ride to work and check prices and companies on the web and Phil ‘z was by far the most reasonable. He gave me an exact time and I met him there on my lunch break. Paid him and he towed it to my home. No hook up fee. I told him how far it was and he gave me a flat honest price which beat all the rest by $10.00 to $20.00. Great guy to deal with. my car broke down off of Valley Hi buy the post office and I called Phil’z to come get it…He is a likeable guy, very respectful and treated my 2000 Kia Sophia(not a great car anymore) like it was a 2010 Camaro. Let me ride along with him back to my house and even called because he was running a bit late! Very Good service and treats military and their spouses right! Will definitely recommend to friends! Philz is prompt and flexible – he met me at a time of my convenience – Highly recommended. Needed my car towed from one place to storage. Phil was professional and friendly. He even helped me push the car up a small hill that was not easy to do by myself. If I need a tow I’m calling phil and will recommend to others. Price was the lowest I found in town. Needed my toolbox moved.Phil did an excellent job and was flexible.I tipped him the first time he moved my toolbox.The second time I didn’t have as much money and he agreed to do it for less.Haven’t met many people these days with as much class and a pleasure to do business with.Highly recommended. Great experience! Was given a fair price over the phone when I called. Came to my location in 15 minutes. We had to call back the next day to get a specific type of invoice for warranty use and we had it within minutes! Great guy and great service! Excellence services! He came to the rescue! Very thankful he has very reasonable prices! Thanks again for helping us out!! I definitely recommend him! I WOULD GIVE 10 STARS IF I COULD! We needed to tow a trailer that lost a wheel. It was 10 pm and only getting later so we started Googling 24 hour towing services in the area. Phil Z Towing was 3rd on the list but I wish they would have been first. We were hesitant to put the trailer on a flatbed as we didn’t want to ruin the axle any further then we already had. Phil advised he had a plan on how we could get the trailer on the flat bed and he arrived within 10 mins of us making the call. His price was fair and his plan worked perfectly. I highly recommend and will pass the word to everyone I possibly can. Thanks Phil Z Towing! Quick to respond and provided very reasonable pricing to tow our vehicle. Arrived on time as promised and got right to work. Vehicle was loaded on truck and we were on our way in about 10 minutes. He was very careful with the vehicle ensuring the front end did not scrape the road when being loaded onto his truck which I very much appreciated. We will definitely use Phil Z Towing again if the need arises. Great experience in an otherwise frustrating situation. I called Phil Z towing because they had good ratings. Phil arrived at the time he said he was going to arrive. Got my car up on the bed and we were on the road in less than 10 min. Very knowledgeable and polite. If I ever need any towing in the future or know anyone needing a tow I will be sending them in Phil’s direction. Thank you for the great customer service Phil! The guy who picked up my car was so incredibly friendly and helpful. He put the donut on my car (the lower control arm was bent and I couldn’t put the donut on myself) and gave me advice on how to properly change a tire for future reference. He was also extremely gentle with my car and took his time, making sure he didn’t cause further damage to it. I cannot recommend them highly enough. And the price was the best in town as well. He came out on a Sunday evening within 15 min of calling him. We had called 10 other places who wouldn’t touch it. This guy is great and his price is very reasonable. Best customer service and the price is very affordable! Phil was very professional, kind, and quick. I called during the work day and asked to schedule a pickup later that evening. He was accommodating and called us to confirm pickup time. I would definitely use Phil’s towing service again! Highly recommended. My wife and I are O.T.R. truck drivers. When our son called us in Chattanooga, Tennessee after swerving to miss a wild hog crossing the road, and ending up through a fence with a blown tire… We called Phil Z Towing! Phil Z was very professional and personal. He knew right where our son would be located, and Phil headed right over. He gave me a guesstimation over the phone sight unseen, and when it was all over -the final price was only $4 higher! A long time ago I used to be in the wrecker business… lots of unscrupulous people there. Phil Z is honest, and treats people with respect, and that is a rare thing in this day and age. I highly recommend Phil Z Towing, and will not hesitate to contact him in the future for all my wrecker service needs. Thank you Phil Z! You got our boy home safe. He was at my location in about 20 minutes. Fast, friendly, and efficient. $75. Phil is extremely nice. Will definitely be calling him if I need another tow. Best customer service. The service man is very patient at very skilled. Price is good as well. Very professional. Professional, friendly and the price was good. I will call Phil again when I need another car towed. Great towing company. This guy was fast, friendly and knowledgeable. The best part was that he charged me HALF of what other towing companies estimated. Would definitely call them again if I needed a tow. Thia man is the Best at his job. 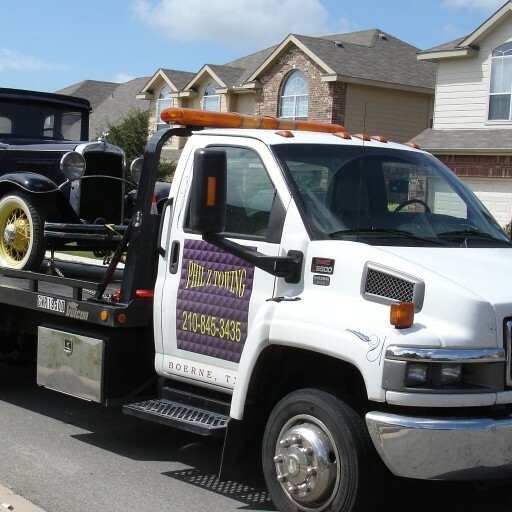 Best Price in Town.There are hundreds of towing companies in San Antonio that can move a vehicle. But only a handful that will get the job done with care as if tow the person was moving was his own. That’s what happened yesterday when Mr. Phil moved my shed. Best towing service! Phil quickly and safely loaded up my car after having the starter die out on me and being stranded for hours. Best pricing and the best service by far! I would absolutely recommend. I called and he was about to leave on another job. He took all my info and called wen he was on the way. He got my truck loaded and to the dealer with no trouble. If I ever need a tow again I’ll be giving him a call. This guy was the best!!! He was the only person I am going to count on whenever I need any towing! He was also the only person who actually did what I asked him to do and didn’t give me the runaround, which was truly appreciated. If anyone ever needs a straight-shooter towing company I am definitely referring them to Phil Z!!! Keep up the good work! Called one towing company and got the feeling i was about to get ripped off, they couldn’t give me a accurate price. Called Phil and he gave me a price within a minute. Price never changed and he was fast. Very courteous and good business man. Will always choose Phil for my towing needs. It’s Christmas Eve- ran to grab one last gift and my husbands truck won’t start. Found his website, and called. He was at our location in less than 30 minutes, with a fair price. Kind, nice man. Thank you so much!!! Phil showed up within 15 minutes and spent 2 hours with a difficult tow job. He is professional and knows his business. Call on Phil an he will take care of you. Fast, courteous, friendly, competent, fair. Just want to say, Phil Z Towing is the guy you want to go to. He not only got my car lifted from a strange spot it was done quick and easy. He also got it to my destination fast and safe. Great guy and great price. Thanks you. Thanks, for your fast response. Phil is beyond awesome. Mellow and down to Earth person, very cautious with your car, professional, and incredibly knowledgeable. You will NOT find a better price nor service. Thank you SO much for towing my vehicle tonight. Your kindness and professionalism were greatly appreciated after a very long and frustrating day…after two other tow companies cancelled and left me stranded for hours. It’s now 1am and I’m finally home thanks to you. Highly recommended. Outstanding customer service. I had my van down in need of a towing contractor to deliver it to a relative’s home. I called several areas and the prices were too high, after several frustrating calls, I ran in to Phil’z. His price was very reasonable and his attitude an professionalism was the best when he came to pick up my vehicle. I would recommend his service to anyone. Give him a try. You will not be disappointed. He might not get to you soon since he might be working a call but if you schedule a pick up in advance, it will be worth the wait. Phil was very nice, polite and meticulous when it came to putting my car on Tue flat bed. His rate was very reasonable. Great service, very satisfied with towing job and price. Would use again.